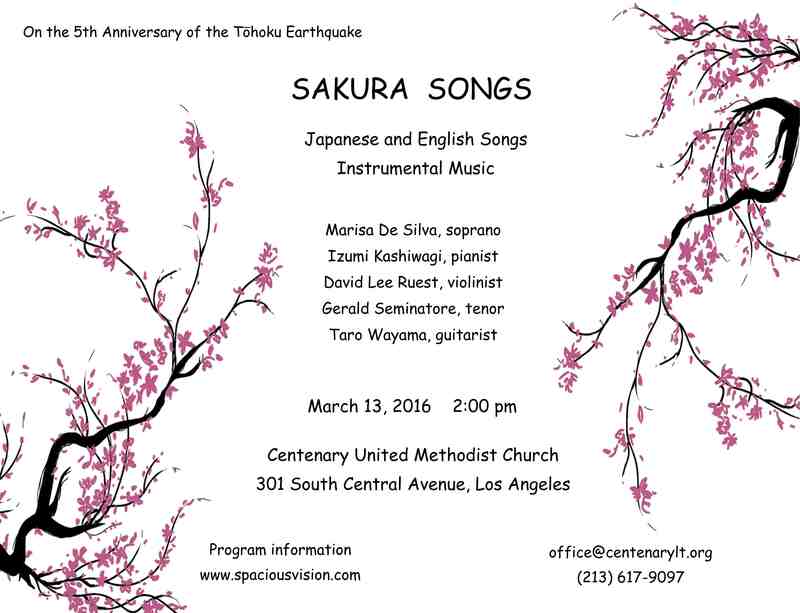 We are pleased to share information about the impressive roster of artists for SAKURA SONGS on March 13 at the Centenary United Methodist Church in Los Angeles. They are introduced here in alphabetical order. Soprano MARISA DE SILVA is active as a performer, voice teacher, and Certified Teacher of the Alexander Technique. Marisa grew up in Japan and has been singing Japanese songs her entire life. Her rendition of “Hana wa saku” — a song dedicated to the victims of the 2011 Tōhoku earthquake and tsunami — has reached nearly half a million views on YouTube. 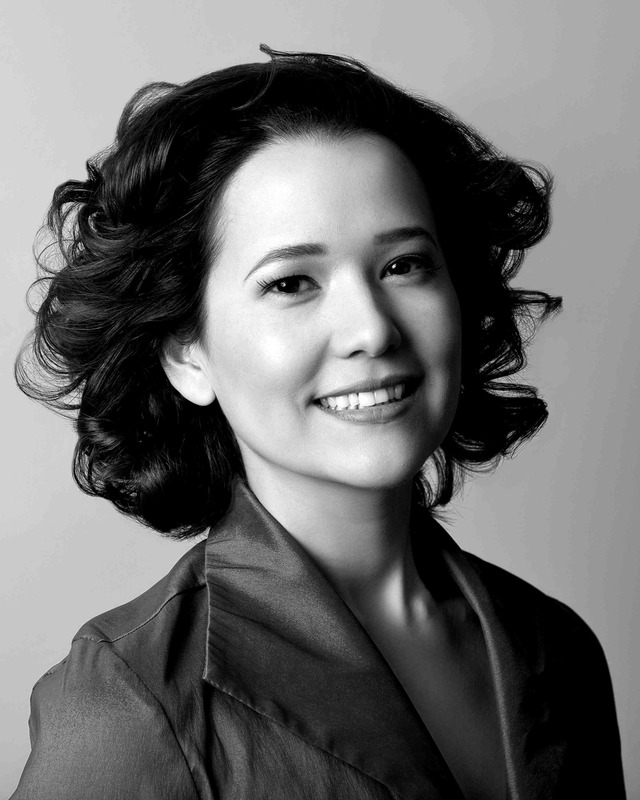 An avid recitalist, she has given recitals in Italy, Spain, France, the USA, and Japan. Marisa has also spent several summers in Spain studying with Teresa Berganza, and performing songs from the Castilian, Latin American, and Catalan song repertoires. She is currently a student in Early Music Performance at the University of Southern California, and teaches at Loyola Marymount University in Los Angeles. Pianist IZUMI KASHIWAGI started playing the piano at the age of five. She attended California State University in Long Beach, where she earned a Bachelor’s degree in Piano Performance. She continued her studies with Kevin Fitz-Gerald at the USC Thornton School of Music, where she earned both the Masters and Doctoral degrees in Keyboard Collaborative Arts. Izumi has been both a student and performer at festivals such as the Aspen and the Quartet Festival in Boulder, CO. She has worked as a collaborative pianist with many singers, including at SongFest in Los Angeles in 2014. As a chamber musician, Izumi has played with several professional instrumentalists, including violinist Charles Castleman and Los Angeles Philharmonic cellist Peter Stumpf. Izumi is on the staff of the Centenary United Methodist Church, and also teaches at Vanguard University. 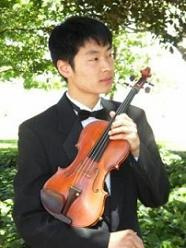 Violinist David Lee Ruest was born in South Korea and grew up in New York City. After earning his Bachelor’s degree at the Peabody Conservatory of Music in Baltimore, he came to California to become a member of the Santa Barbara Symphony. He then went on to graduate study at UCLA, where he earned his Master’s degree. As an orchestral violinist, David has also performed with the Harrisburg, Annapolis, Baltimore, New West, and Long Beach Symphonies. He also plays the viola and is active as a private teacher in both instruments. Tenor GERALD SEMINATORE is the director of the Spacious Vision Song Project. He began his musical career with professional ensembles including the Handel and Haydn Society, the Boston Early Music Festival, and Emmanuel Music. Operatic engagements in the USA have included roles with the Chautauqua, Dayton, Glimmerglass, Oakland, Santa Fe, and West Bay opera companies. 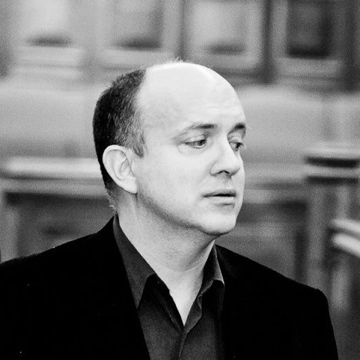 Gerald made his European debut at England’s Aldeburgh Festival, and went on to become a member of the solo ensemble at the Dortmund Opera in Germany. He was also a frequent guest artist at the Frankfurt am Main Opera, the Rheinland/Pfalz Theater in Kaiserslautern, and the Bremen Opera. His concert performances have included appearances with many orchestras and choral ensembles. Gerald’s singing has been recognized with numerous awards, and praised in publications such as the London Times, Opera News, and San Francisco Classical Voice. Gerald has taught at several colleges and universities in Southern California, and traveled extensively as a master class teacher in the United States and in Europe. TARO WAYAMA is a Japanese born guitarist and composer. He was the First Prize winner in the 2003 Aron Green/American String Teachers Association Guitar Competition, and the Second Prize winner in the Thailand International Guitar Competition. As a composer, Taro received the award for “Best Original Score” at the Los Angeles Movie Awards for the independent film Anne Jennings. He is an active soloist and a chamber musician, and has performed in Japan, Thailand, Canada, and the USA. Taro frequently collaborates with instrumentalists and singers in presenting Classical music from the Renaissance through 20th Century, as well as venturing into Folk and World music. Taro earned both his Masters and Bachelor of Music degrees at the University of Southern California, where he studied guitar and composition with Pepe Romero, William Kannengiser, James Smith, Brian Head, and Scott Tennant.